You wouldn't think it from the photos, but Thessaloniki is Greece's second largest city. The layout is very walkable, with lovely low-rise buildings crowding around a generous, historic harbour. All roads run either to the sea or parallel to the sea. Relics from this city's past lives, under Roman, Ottoman and Byzantine rule, are scattered around, with more treasures seeming to turn up all the time. So the many world class museums are well stocked. Our pick of the best places to stay in Thessaloniki range from a chic boutique retreat to the city's largest hotel. The White Tower is Thessaloniki's most famous landmark and though it looks a statuesque beauty, it's got a pretty grizzly history. Only 75 people are allowed into the tower at once, so arrive early if you want a chance to see the view. Most of Thessonaliki's other sights are between the tower and the ferry port, along the arc of the Thermaic Gulf. There's a wonderful promenade along the waterfront, which runs for about four and a half kilometres. The Archaeological Museum is closest, and it's not just the inside, filled with important Macedonian artefacts, which is worth poking around, there are some interesting stone fragments and even some elegant sarcophagi scattered around the grounds. The Museum of Byzantine Culture is the other major museum. Thessaloniki also has a number of other museums devoted to specific eras of this city's history. The Olympic Museum is right at the other end of the bay. As well as museums and the promenade, there's the old Byzantine walls to stroll around, and the picturesque area around them. Thessaloniki is blessed with some wonderful Byzantine churches, built between the 5th and the 14th Century. The Agia Sophia and Agios Demetrios are especially impressive, but there are smaller ones dotted all over the city. The market at Modiano is a great place to mingle with locals and pick up some bargains. Its easy access from the rest of Europe and vibrant university community keep Thessaloniki fresh, hip and inventive. It's got a great restaurant scene and plenty of places to go after dark. A wonderful mix of beauty, culture and history, the best places to stay in Thessaloniki tend to get busy in the summer months, so get organised and book well ahead. Crisp and contemporary, the City Hotel offers good value and easy design in whites, bright greens and natural light, so it's one of the best places to stay in Thessaloniki if you don't plan to spend much time in your hotel but want to enjoy the time you do spend there. The excellent restaurant and spa make it an even easier choice. The Excelsior is quite a bit grander, and closer to the beaches and many of the main historic sights, so it's another very easy base. If you're staying a bit longer this is the sort of hotel that can also help you arrange all sorts of local adventures, from sailing and snorkelling trips to shopping expeditions. The hotel also has panoramic views from the roof garden and a fantastic French bistro. One of the city's few remaining Ottoman buildings, the delightfully old school Capsis Bristol was originally Thessaloniki's post office. And its pink stucco facade has survived fire, earthquakes and two world wars. It's charming inside too, with deep, handmade carpets and a mixture of antique and reproduction furniture. 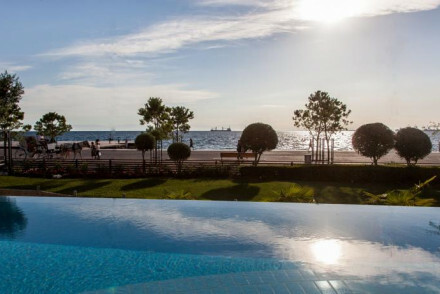 If you're here to treat yourself then one of the best places to stay in Thessaloniki is the Makedonia Palace - a landmark hotel with memorable views over the gulf towards Mt. Olympus. The lobby feels like it could appear in one of the classic '60s Bond films, and the whole hotel retains a sort of jet-set charm that makes it a unique, vibrant place to stay in a unique, vibrant city. Fresh and modern, The Met Hotel specialises in a contemporary minimalist style. Featuring chic rooms, a lively bar and a superb Greek fusion restaurant, it's perfect for people looking for a hip place to stay in Thessaloniki. 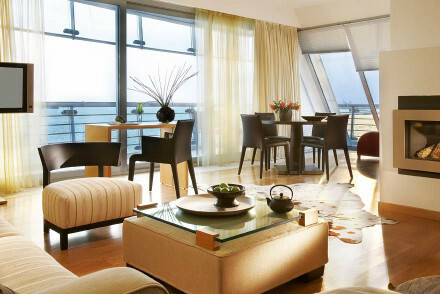 Daios Luxury Living offers a range of rooms and suites in a prime position right on the seafront, just minutes from the White Tower and Aristotelous Square. Interiors are light and contemporary, plus there's a Mediterranean restaurant and popular bar. Have a look at the options at our online partner Booking.com. The best time to visit Thessaloniki is from May to October when the temperature sits comfortably in the twenties. Be warned, in July and August the city gets very busy. 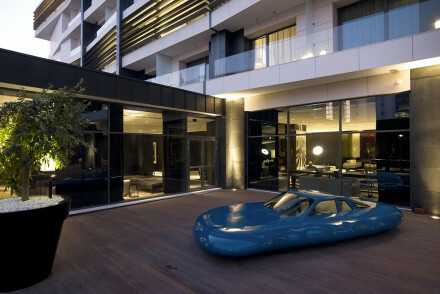 Browse through our list of all the best places to stay in Thessaloniki. A crisp contemporary hotel with an excellent restaurant and spa. Modern rooms and suites in shades of white and green have all the mod cons, lots of natural light, and private balconies. A great choice for any traveller on a short stay, and great value. 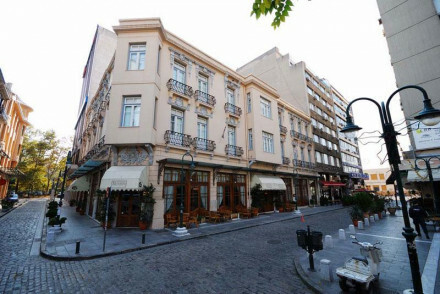 Sights nearby - Located in the centre of Thessaloniki, easy walking distance from all major attractions. Contemporary design hotel. Interiors are minimalist with monochrome walls, chic modern furniture and artworks throughout; most rooms have seaviews. Rooftop outdoor pool, full spa and lounge. Great Greek fusion cuisine and buzzy bar lounge. A stylish choice to explore the city from. A luxury waterfront property with beautiful views of the Gulf and Mount Olympus. Modern rooms take advantage of the views from large windows or private balconies. The restaurant excels in seafood. Ideally situated near the city centre for both tourists a business people alike. A Boutique retreat in the Ladadika district with bars, clubs and restaurants on its doorstep. A traditional ottoman era building, stylish cocooning interiors, and a great restaurant. Explore the city streets, or take a relaxing stroll along the scenic Grecian coastline. A beautiful hotel with gorgeous rooms and suites. Creamy interiors with lots of natural light and all the mod cons. Excellent French bistro, steps from the beach and historic landmarks. A great choice for sun seekers and honeymooners. Foodies - Fantastic Bistro with French style cooking. 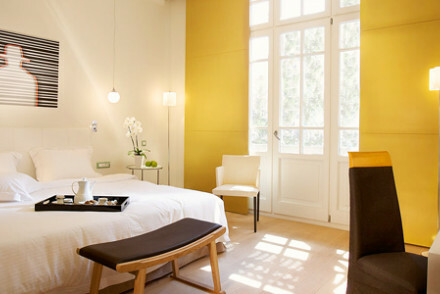 Bright, clean, spacious modern suites in boutique hotel situated in buzzing Greek city of Thessaloniki. Great views over the White Tower and Thermaikos Gulf. With a bar, restaurant and massage facilities. Walking distance to sights, museums, restaurants and shops. Child friendly. A chic city stay.